I have been on a long hiatus from this blog. While I was off and busy I was always wishing I could come back and show some of what I had been busy at, but have clearly failed to for a long stretch. Well, I'm hoping that now I can catch-up on some of that. Among the projects that I worked on while I was away, this is one of the few that was for me. All me. I think I have been intrigued by the look of corsets since childhood. 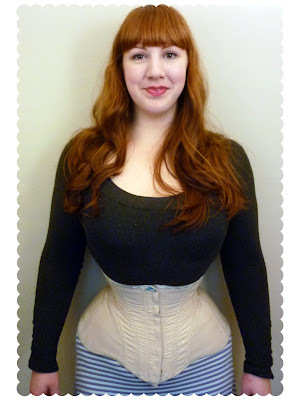 I always loved the form that clothes from corseted eras had and thought that the corset itself looked beautiful. I never tried one on until university when I was doing a production that was set in a corseted period. Granted the first one I tried on was not the best quality and certainly not fit properly to my proportions, but it was still positive enough of a first taste. I loved the feel of being hugged and the exaggerated hourglass that it created. I've always been very hourglass on my own but putting on a corset was the first time I remember really thinking that the hourglass was something I wanted to be. In fact, it turned out that I was hourglass enough on my own not to fit properly into standard sizes designed for 'contemporary figures' that were in stock in our costume department, and a teacher who had collected her own set of custom corsets for shows was kind enough to lend me hers. WAY BETTER. Years later I have finally sewn a corset for the first time. Of course, I couldn't be sensible and start out with your typical 5 horizontal panel pattern. No, that would be too logical. I decided the first one I would try my hand at was the Angel Underbust Corset by CorsetTraining.net. So easy, right? Well, the pattern wasn't difficult, but I had not yet mastered (or even tried-out) many techniques involved in corset making, so there are certainly flaws. The most noticeable flaw is the amount of wrinkling that occurred in the outer fashion fabric. I do like the pattern very much, but if I make it again I will do so with a number of alterations to the fit.While the pattern is designed specifically for waist training, the lower front which would allow greater movement and pressure just on the floating ribs for most is too short on me and ends up just under all of my ribs, so causing a few more problems than it was intended to solve. Next time I would add length to the top front. I also was worried about it being too small in my hips, as is usually the case, and ended up adding more than I needed to and I have way too much space in the hips now. 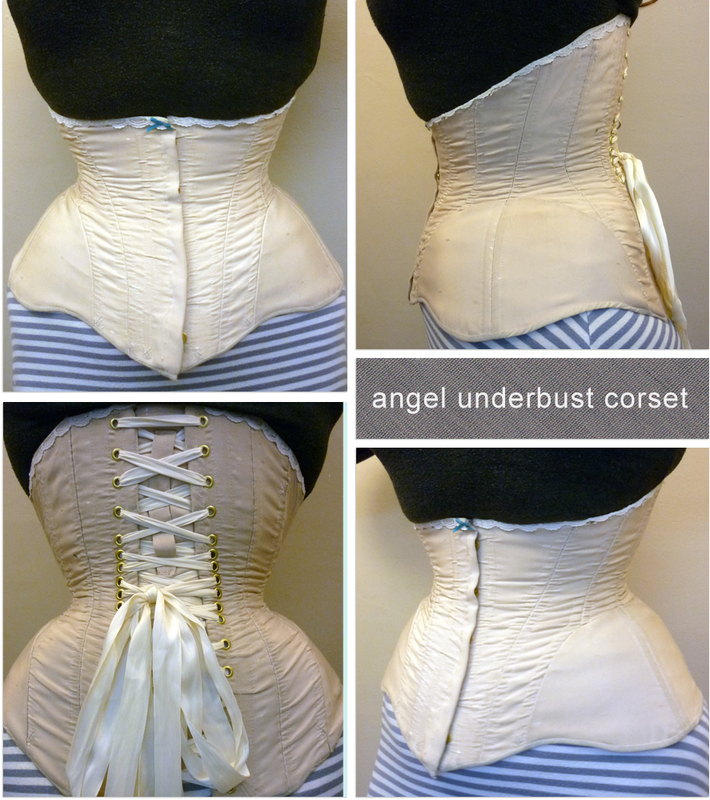 I hope to take all of these lessons into account as I go to make my next corset.